In this guide, we will cover a variety of different knife sharpening techniques and the best knife sharpeners of the Wusthof knife brand. If we had to choose just one product, it would be the Wusthof 3 stage electric sharpener to help us get a better edge without having to muscle our knives through the sharpener. 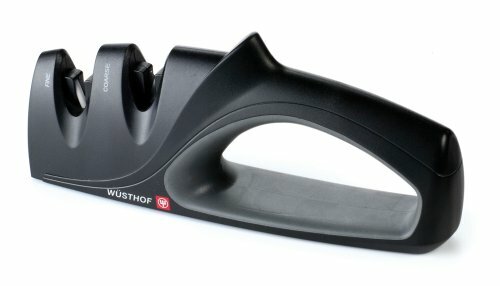 Why Choose Wusthof Knife Sharpeners? If you couldn’t tell by the name, Wusthof is of German descent. And German craftsmanship is often regarded for its high quality. The company was founded over 200 years ago and is highly valued and respected in professional kitchens. The family-run business knows all about knives and how to care for them, which is why they have also created a line of knife sharpening tools for professional and amateur kitchens. Sharpening your best kitchen knives is one of the most important things you can do in the kitchen. Not only do they allow you to cut and slice food easier, but they also make things safer. It’s safer because a sharp knife doesn’t require as much pressure to cut something which reduces serious slips. Most Wusthof sharpeners have different “stages” to sharpen your knives. So it’s very important to understand which stage to use on each particular knife. 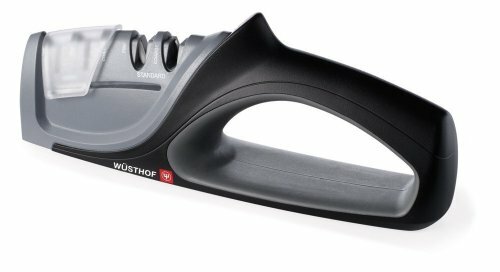 The Wüsthof – 2 Stage Hand-Held Sharpener is easy to use because it doesn’t have a lot of moving parts or require electricity. All that is required is that you keep even pressure on the knife as you draw it through the slots. There are only two slots, or stages, one for coarse honing and one for fine sharpening. If the blade of your knife is in very poor condition, it might be worth it to spend some time on the coarse slot. That will remove a lot of metal to help get rid of the dents, rust, and other imperfections on the blade. For everyday use, you should use the fine sharpening slot to keep your blade sharp. That will remove the burs on the blade edge which are created as you cut food and press the knife against the cutting board. It should only take 5 or 6 strokes to bring your knife back to razor sharp. 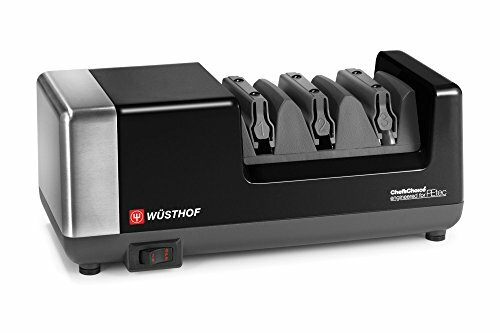 Another option to consider is the Wusthof Precision Edge 4 Stage Knife Sharpener. Do you have to clean hand-held sharpeners? While the directions don’t mention anything about cleaning it, after some time, metal dust can build up on the carbide and ceramic sharpeners. That could cause problems when drawing the blade through the slots. To make things easier and faster, an electric sharpener can save some strokes once you get a handle on how to use it. The instructions that come with the Wusthof 3-stage PEtec Electric Knife Sharpener are very clear and takes little time to master. Many people prefer electric sharpeners because they feel that they get that “factory” edge back on their blade easier than a handheld non-electric sharpener. What are the 3 stages? What is the PEtec Edge? PEtech (Precision Edge Technology) is a 14-degree angle that Wusthof sharpens all of their knives at. This sharpener can be used with other knives as well, not just Wusthof Knives, but it may take extra initial coarse sharpening to get to the 14-degree blade angle. Can It Sharpen Serrated Blades? The first and second stage will help sharpen the serrated blade, but the 3rd stage of this knife sharpener will be best suited for sharpening the teeth. Serrated blades are very tricky to sharpen, so you may not experience the same quality of sharpening as you would with a straight blade. Will It Scratch My Knife? There is a chance for some scratches if the guides are dirty when you draw the knife through the sharpener. The sharpened edge is likely to get some scratching since the diamond wheels will be cutting and grinding metal away to make the blade come to a point. But after using stage 3 for stropping and honing, everything should be okay. Be sure to follow the instructions carefully to prevent excessive pressure which may cause deep scratches. There are different types of steels that you can buy. Some are like sharpeners and others are more for honing. Some are diamond coated like the Wusthof diamond sharpening steel while others are made of ceramic or steel. Regardless, using a sharpening steel or honing steel is essential in the kitchen. Sharpening steels are often confused with knife sharpeners. When a sharp knife starts to feel dull, it’s because tiny burs on the blade’s edge have formed. That makes it harder to slice things. The purpose of the sharpening steel is to remove these burs and help realign the blade’s edge. This will give you a “sharp” knife again. A knife sharpener will remove large amounts of metal from the blade to produce a new edge. So in essence, the steel sharpener fine-tunes the edge back to its dangerous self. There is much debate on the best time to put an edge back on your blade. Of course, we believe you should always use a sharp knife, so as soon as you feel it needs to be fixed up, do it. But whether you decide to do it before you use the knife, during, or after you will notice an improvement. Whetstone sharpeners are more of a traditional way of sharpening a knife. Whet, similar to the way we say “wet” refers to grinding or friction. Many types of hard grainy stones are used to help sharpen knives. Often a liquid such as water or oil is used to act as a lubricant while sharpening. Otherwise, it will be very difficult to sharpen the blade properly. The Tri-Stone Sharpener above is an example which requires a lubricant. Diamond coated whetstones don’t require liquid. 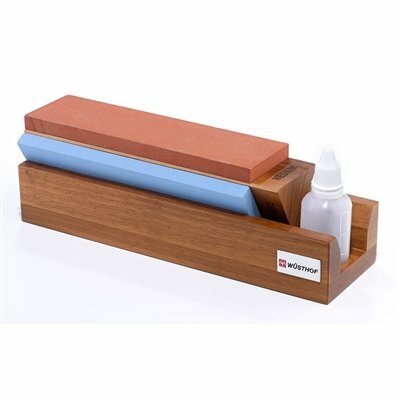 The Wusthof Whetstone sharpener below is made of ceramic and also doesn’t require liquid to use. However, it does need to be cleaned with hot water before putting it away or if there is a large amount of blade dust built upon the stone. While the initial price of the Wusthof Whetstone is pretty high, the fact that it is made of ceramic means it will last forever. The downside is that it may take longer to get a good edge on your blade. There are two sides to the Whetstone, coarse and fine. There is a bit of an art to sharpening a knife with a whetstone. You must pay close attention to the angle of the blade while sharpening. Otherwise, you may end up wasting a lot of time and still end up with a dull edge.